Windows version; story file for Linux and Mac interpreters; PDF feelie; walkthrough. Congratulations, convict 76954! You have been selected for scientific experimentation! You will be matter-transmitted to exotic non-Treaty worlds - where opportunities abound to take in fantastic sights and mingle with colourful locals! Although you take the guise of the protagonist, the true heroine of this story is your antagonist, Doctor Sliss. It is not difficult to see why this character earned the game its XYZZY award: It is her wonderfully comic and spirited personality, not that of the player, that suffuses the game; it is mostly her motivations and ambitions, not those of the player, that drive the story forward. In many ways, she is the GLaDOS of this particular facility. ROGUE is a tongue-in-cheek sci-fi trek that'll keep you coming back for more. Normally when I play IF, I play to get through the story. And often, IF is streamlined to that end: the rooms you encounter and the people you talk to and the objects you find are all designed to either get you "in" to the story (through atmosphere and object descriptions) or get you to the end of the story. ROGUE's mission areas are one of the few instances I've seen in IF where you can plunk around for a long, enjoyable time, not doing anything to further the plot (if you desire). In other words, ROGUE's mission areas act as a minigame, and a darn fun one at that. You can play an infinite amount of missions, because they're procedurally generated. But they're not lame missions, no--each world you're beamed to has its own fully-realized character, whether it's a cybernetic city or a series of grassy fields. When you're done with a mission, you return with all kinds of crazy loot, resulting in kooky commentary from the doctor about the booty. Oh, yeah, and you get money, too, which means you can buy things from the store. Delivery to your, uh, "home" is automatic; once you've bought something, return to your house and see the awesome alien junk you've acquired! The ability to buy all the store's random merchandise and play the missions at your leisure, without being required to do anything to advance the plot--heck, without being *penalized* for not advancing the plot--delighted me. Absolutely delighted me. I also enjoyed the unconventional setup of ROGUE. It starts in a prison. I was expecting it to go 1984, but then I (Spoiler - click to show)wind up a lab experiment. I was expecting it to go (Spoiler - click to show)PORTAL, but then suddenly I'm roaming around like a (Spoiler - click to show)TOMB RAIDER with access to the Home Shopping Network. Then things go kablooie and now I feel like I'm driving through (Spoiler - click to show)DIE HARD. And that ending? (Spoiler - click to show)What is this, THE PRESTIGE meets TEMERAIRE? It was wonderful to have my expectations swept aside in such fun ways. I do have one complaint, though, and it almost made me take off a star. I understand this game has a subversive sense of humor. And yes, parts of Dr. Sliss' questionaire raise an eyebrow. But in my mind, the main bulk of the game felt "PG," so encountering such strong language in the finale felt really REALLY jarring to me. It didn't fit the tone of the rest of the game. Plus, while I know IF is generally made By Adults, For Adults...the whole scenario has a Bruce Coville/ARTEMIS FOWL kind of vibe that I think middle-school kids would get a kick out of. I would have loved to've played this game as a kid, and I know there are a lot of parents and children out there today who'd have fun playing through this together. With all kindness, I invite the author to consider editing out that language in a post-comp release. Even if that never changes, I highly recommend ROGUE OF THE MULTIVERSE. You'll love the alien cultures, you'll love Sliss, you'll love the rip-roarin' finale, and you'll love taggin' random items for booty. It's a blast. (Spoiler - click to show)The game will also prompt arguments about whether one should make kissy faces at alien lizard doctors or try to sock them between their stupid beady eyes as soon as one gets the chance. 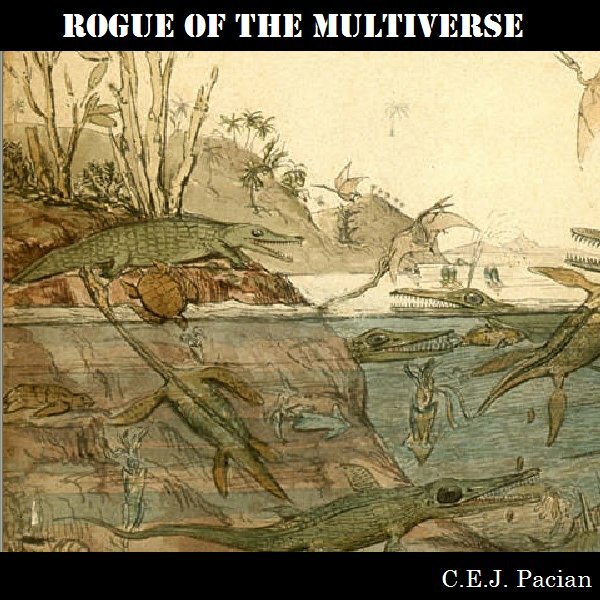 In this game you play the eponymous rogue, and while "Rogue of the Multiverse" sounds like a real badass title, the kind to be bestowed upon a Han Solo, the segment of your life portrayed here happens to be one of the mushier ones. In the space prison where the game begins, none of the other inmates react to you as if you have any street credibility at all, and pretty soon you're the lab monkey in the rather unimpressive experiments of one Doctor Sliss, a condescending lady lizard who is convinced that bananas are your god. I did feel a little annoyed at my own confusion at having to move about the science complex with the commands 'forwards' and 'backwards', but this ultimately wasn't a huge issue. Thus a rogue's lot in life appears to be that of playing second fiddle to a reptilian scientist, searching randomised grids of alien turf for interesting people and things to tag at her behest. The descriptions of the alien inhabitants and their behaviours are pretty cute, and each bout of exploration feels not entirely unlike a game of Hunt The Wumpus. Once you work out what you're doing, this section is fun but pretty easy, so it's good that it doesn't outstay its welcome. I was disappointed, however, that I was not able to butter up some of the aliens with goodies procured from the Doctor's complex to convince them not to remove their tags. Just when you think you've got this grid searching thing nailed, a helpful space agent shows up in a space toilet and assures you he can bust you out of captivity if you just buy him the stuff that will allow him to cobble the escape thingy together... Eww, but he's in the space toilet! Moving toward your escape is arguably the most tense part of Rogue, but afterwards, proceedings get - relatively speaking - even weirder. My own sense of aggro towards Doctor Sliss, my former jailer, after the tables were turned (or at least shuffled around) never did find release. At first I thought the game was strongly signalling that I could not avoid casting my lot in with her, to the extent that when I had an opportunity to do something contrary to her wishes, I missed it. Plus I was probably distracted by the recent excitement of a chase on jet bikes, another sequence which arrived with the game's customary surprising-ness. What's obvious though is Sliss's presence as a well-written, if inscrutable, character, whether you feel amorous or murderous towards her. The game's last scenes on another planet (assuming you go that route) feel like the unheralded ending of a Choose Your Own Adventure book, the one where you forget about the adventure you were having for the last 80 pages and suddenly travel to another time, meet new people and assume an entirely new role, all within the space of one page and one illustration. Of course this isn't literally what happens in Rogue, but it generates a similar sensation. And this is not an inappropriate final sensation for a game whose story structure and interests have hardly been traditional beginning, middle and end. The game feels more like a window onto the amusing and chaotic adventures of a rather put-upon individual, adventures which were probably just as strange before the game began and will continue to be as strange after the game ends. The title could almost be a joke, or at least ironic. Or it could be the po-faced earnest assessment of the main character's view of him or herself. The game's peculiar turns felt weird while I was playing it, but they evoked a small portion of universe held together by wonky chance rather than sense. It was the vision of that wonky universe which stayed with me after I completed this well written and executed adventure. I'm finding it hard to think about the game as a whole. It is intentionally modular, and I have no problem with that, but there wasn't enough of a character thread holding it together, leaving it feeling like a dream: (Spoiler - click to show)"Well first I was in prison with these scary aliens, and then I was running around in a space suit, and THEN there was this talking poo! and THEN! we were on a jet bike!" I felt the PC was a puppet and had assistance from unsavoury quarters -- (Spoiler - click to show)a toilet worm? really? -- where I would have preferred to work things out for myself. Every puzzle is guided by NPCs, leaving the PC with only the carrying out. Not that the carrying out wasn't IMMENSE fun. It really was. The pace was kept very high, and the action felt thrilling and stylish and very imaginative. There was (Spoiler - click to show)a vehicle chase!! How often do you get chases in IF? in any written fiction? It was awesome, I was totally swept up in it. Answering "no" to "do you identify as male or female?" actually caused the game to break completely. “Pip!” the doctor repeats cheerfully. “How barely pronounceable! Dr. Sliss just smiles and nods. and you are out of the conversation, the game never progresses, and you have to restart. We can leave the political discussion of non-binary gender for another day, for now I'll just say; that's quite a bad bug for an otherwise solidly programmed game. The game is compassless, it uses forward-left-right instead of north-east-west. I'd not come across this before and loved how subtly it was done. It really cleans up the prose to be able to do this. Not sure how easy it would be to keep the locations straight in my head for a bigger map, but it was fine and very welcome on this scale. Altogether a brilliantly fun game to play, but could have been tighter with more PC-led choices. I need help with my endings in my works so I'm asking for any suggestions for games that have great finales, denouements, and/or epilogues, so that I may study what others have done. Thanks!